Some 15 km wide, Cook Strait separates New Zealand’s two islands. The northernmost desert of Australia is also the world’s second largest desert (1.9 million km2) after the Sahara. Some 170 km wide, the Torres Strait connects the Pacific and Indian oceans; it is named after a 17th-century Spanish mariner. Relatively small ocean (76 million km2) located between Africa, Asia and Australia; it has high water temperatures and is dotted with numerous islands. 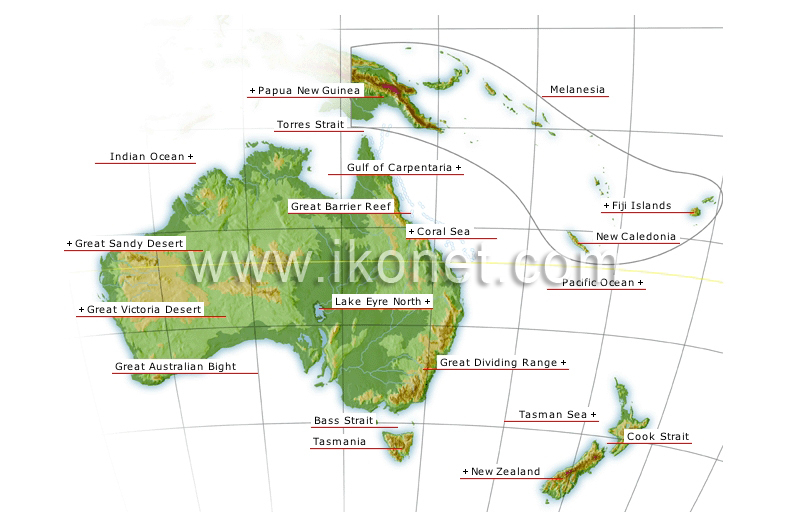 Part of Oceania (965,000 km2) that includes Papua New Guinea, the Solomon Islands, Vanuatu, New Caledonia and Fiji. Coral reef extending over 2,400 km; a Unesco World Heritage Site, it provides a habitat for numerous forms of marine life. Westernmost part of the Pacific Ocean; its warm waters (from 25°C to 28°C) are subject to currents that reverse, depending on the season. Mountain range extending 3,500 km; it includes Mount Kosciusko (2,300 meters), Australia’s highest peak. Some 200 km wide and relatively shallow, it separates continental Australia from Tasmania.